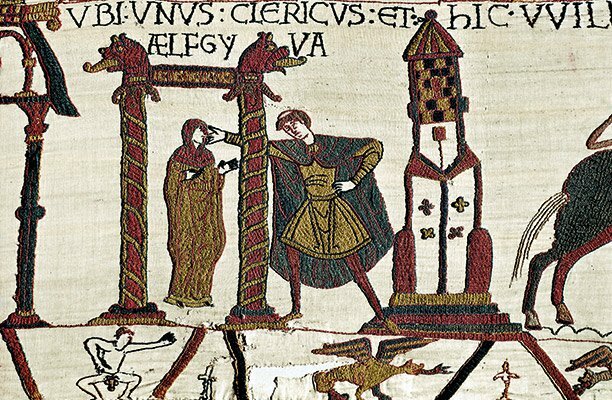 A new theory has been put forward on a mysterious scene in the Bayeux Tapestry that appears to show some sort of sexual scandal that involved a woman named Ælfgyva. Joanna Laynesmith, a medieval historian from the University of Reading offers two possibilities in a new article that appears in the October issue of History Today. In trying to understand “the million dollar question” as Laynesmith puts it, several different explanations have been attempted. Laynesmith believes that this Ælfgyva was most likely Emma, who was the wife of two Anglo-Saxon kings – Æthelred the Unready and Cnut, and was the mother of two more – Harthacnut and Edward the Confessor, or that it could be Ælfgyvva, the first wife of Æthelred. Such a scandal would imply that the children these women bore were illegitimate and could not inherent the English throne. Ælfgyvva, the first wife of Æthelred the Unready, was also one of the ancestors of Edgar of Ætheling (c.1051 – c.1126) who in 1066 was still a child but also had a very strong claim to the English throne. Meanwhile, Emma was also the subject of some stories of scandal too, which meant that her descendants, which includes Duke William (Emma was his great aunt) could not rely on these relationships to the obtain the crown. Laynesmith argues that this scene helps to show that “William had no more rights to throne than Harold … The importance of the Bayeux Tapestry really is that it is concentrating on the relics – the oath that Harold famously swears on the relics and it is only after this that William had the greater right to the throne than Harold.” This kind of interpretation would profit Bayeux Cathedral, as this was the place where the relics were kept and would add to this church’s prominence. Joanna Laynesmith’s article, “A Canterbury Tale” appears in the October 2012 issue of History Today (Volume 62, Issue 10). Click here to access this article.